Which is the best airsoft mask? With about a million options on the market; full face vs half-face, wire of steel mesh, anti fog vs regular – making the right choice can be difficult. This is no excuse to forego the most important step in your airsoft gear buying spree – adequate face protection. Verdict: The Coxeer Full Face War Game Masks is the best airsoft mask! Full face, super breathable, looking wicked cool and offering unsurpassable protection makes it the perfect airsoft mask for most players! 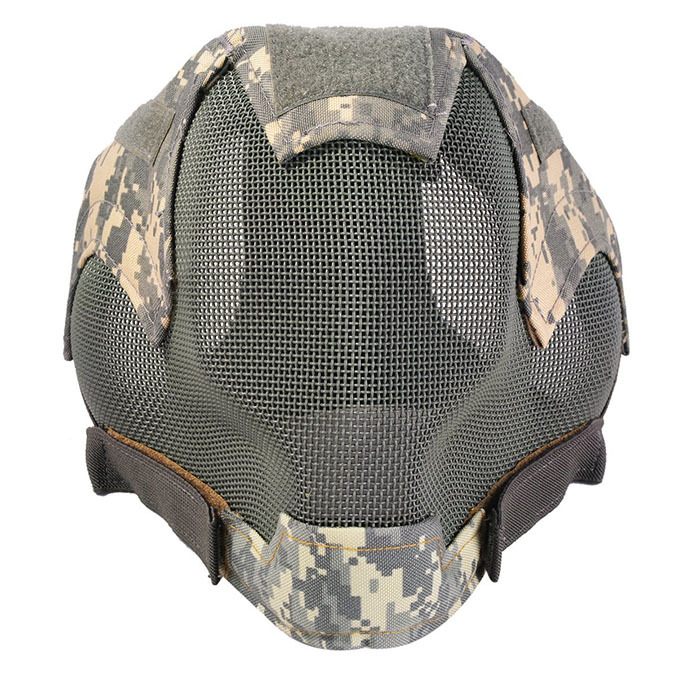 Whether you’re a hopeful beginner or seasoned airsoft veteran, assuring you have the best airsoft face protection is of utmost importance. This is why I decided to write out this guide and introduce you to the world of airsoft masks! In a Hurry? Check out my top 3 airsoft masks in the table below. Continue reading if you’re looking for in-depth reviews! The Coxeer Full Face Steel Mesh Mask is an extremely durable, breathable and effective full face mask. My #1 choice for beginners and veterans alike! Due to it’s all-steel-mesh nature, this mask will never fog up on you and offer you excellent visibility – no matter the outside conditions. The secret behind the Coxeer is in the steel mesh which may look ordinary, but it is in fact extremely tough. This mask can take 700 FPS hits no problem, which makes it practically indestructible on the battlefield. Safety being the #1 priority, the Coxeer Full Face Mask passes with flying colors and sets the bar extremely high. The inner lining and fabric is designed to absorb as much shock as possible. 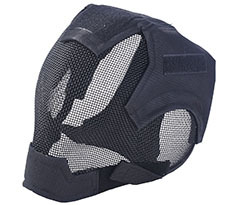 Given the quality of the materials this mask is really going to keep your head safe from all angles, even your ears and your mouth which are not entirely protected by the traditional mesh masks. Plus, you can even wear glasses with this mask if you feel the need to. Another great feature is that it’s fairly lightweight and easy to wear. Elastic laces can be adjusted to fit your head. The steel mesh can also be additionally bent and molded however you want. Some customers reported that at first it pressed against their cheeks or nose, and after they’d bent it it was perfect. Lastly, the mask being mostly mesh, it won’t affect neither your hearing nor speaking ability as it lacks bulky plastic material, covering your mouth and ears. This is often overlooked but super important in dynamic airsoft battles. There are certain size restrictions, however. According to the specs this mask fits 23 inch or smaller heads, so you might want to measure before placing the order just in case, although there weren’t many complains about it being small. It comes in 3 distinct styles: black, and two camouflage types. The mask offers ample room to attach your patches, logos or other decorations. Make use of that real estate and customize the mask to your liking! The Coxeer is a no-brainer buy and impresses across all channels. It deserves the #1 podium position like no other. 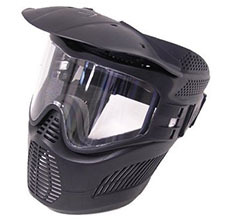 An awesome looking, super durable, breathable airsoft mask suitable for everybody. A win in my book! A very close second, OutdoorMaster’s Full Face Mask is extremely impressive but just misses first place due to missing out on protecting the back and top of the head. Don’t let the cool look fool you — this OutdoorMaster Skull mask has so much more offer. It provides excellent full face coverage and protection against pesky BBss, while at the same time allowing you to clearly see where you’re going. Oh, and it lookgs friggin badass! The steel mesh, covering your eyes, offers more than enough protection while at the same time avoiding fogging issues which are so often a burden with regular goggles. Perhaps the best thing about this mask is that it is super comfortable and fits really well around the face. It can fit most adults and teens, and there appears to be no complains about the size. Plus there are six elastic straps that are easily adjustable to fit virtually any head size. As far as the material is concerned, it is made of a single piece of synthetic resin, which is great because there are no loose hanging parts. It’s extremely durable and takes ‘hits like a champion boxer’. The mask is rubber padded on the inside so it should feel nice and snug. Another feature that puts this mask right at the top of my list are the multiple openings that allow the air to circulate while you’re running around. This makes it fairly breathable and keeps your head cooler. 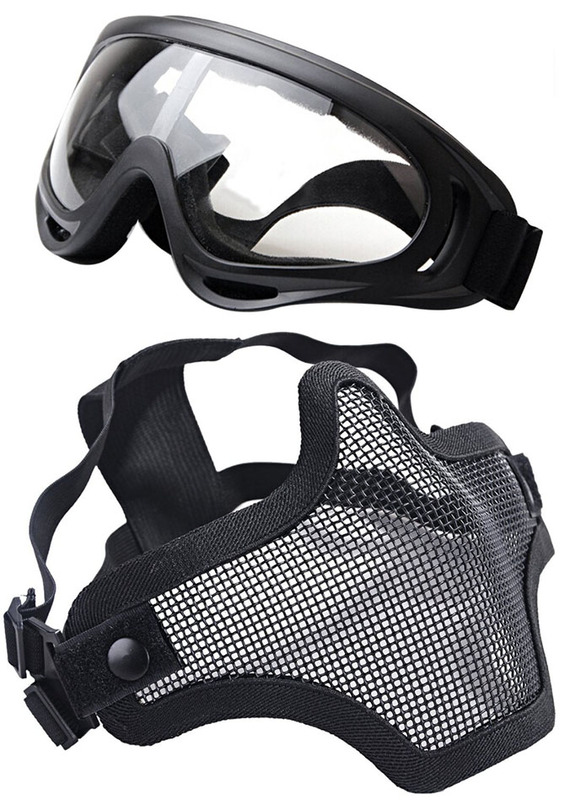 In addition to being super comfortable, this full face airsoft mask comes in many different styles (9 to be precise). Depending on your preferences, you can choose from the minimalistic black, or nomad-like, to the mysterious will-o’-the-wisp one. Either way, they all look cool, but most importantly this mask will keep your head safe and sound. The only reason why this mask falls short of first place is due to the fact that the back of your head will be exposed. The OutdoorMaster is an extremely useful mask and almost unbeatable for the price. Had it offered back-of-the-head protection, it would be leading the race without question! A super awesome, versatile and affordable half face mask that can be customized and adapted for many things outside of airsoft! The OUTGEEK Two Piece Half Face Mask is an excellent choice and makes a great budget mask for all airsoft players. This simple yet functional airsoft mask includes tactical goggles made of plastic and a lower face protector made from steel mesh. This half face mask is extremely customizable, easy to use and will never smother your face with hot air. The only possible downside to this mask may be the fact that it doesn’t cover your lower cheeks, so it doesn’t guarantee full-face protection. As for the goggles, they usually provide a clearer view than the mesh mask (unless they get all fogged up!). But the good thing about these goggles is that they don’t fog up at all (or rarely), which is not something you can find at every corner. Having to wipe your goggles all the time can sidetrack you from the game. Because of their design and structure they’re light and foldable. Even though they look bulky, they fit great and hold really well. For a pair of plastic goggles they bend easily, but it can take a little time before it molds to your contours. Another advantage of this two-part masks is the fact that you can combine it with other pieces of equipment that you might have. Super adaptable and super fun! 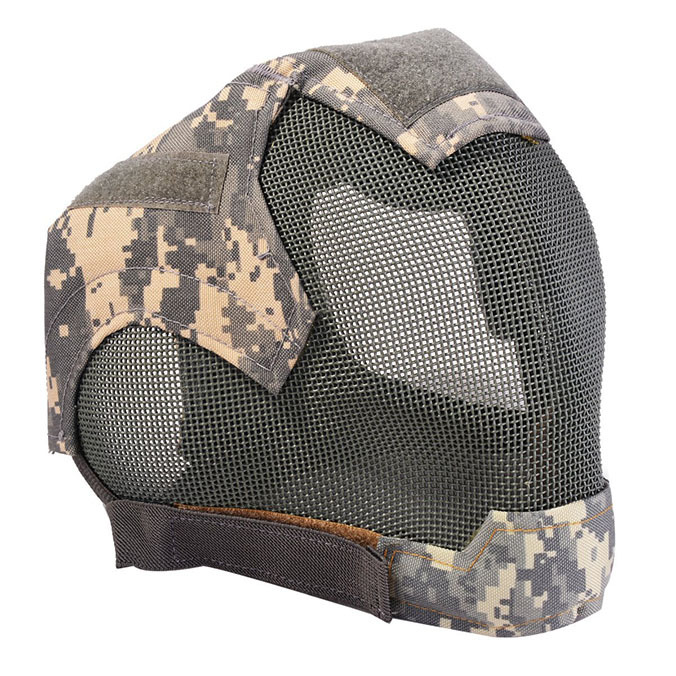 The steel mesh mask is light and durable and will stop any pellet, without damaging the mesh in the slightest. It will protect your nose, mouth and most of your cheeks. In addition to being light, it’s also airy and breathable and most of the time you won’t even know you’re wearing it. As far as the size goes, it says it’s one-size-fits-all mask, and by definition it fits most people well. There are two 2 elastic straps at the back, that you can adjust how you want. The mask comes in several different variations and colors for you to chose from. Depending on your face features, this mask will either fir perfectly or a little bit tight. Some players complained the mesh part wasn’t fitting well as it can press against their nose. Even then, some brute force will mold the mask just right. Overall, if you’re a fan of half-face masks and you’re on a budget – this may be the perfect choice for you. 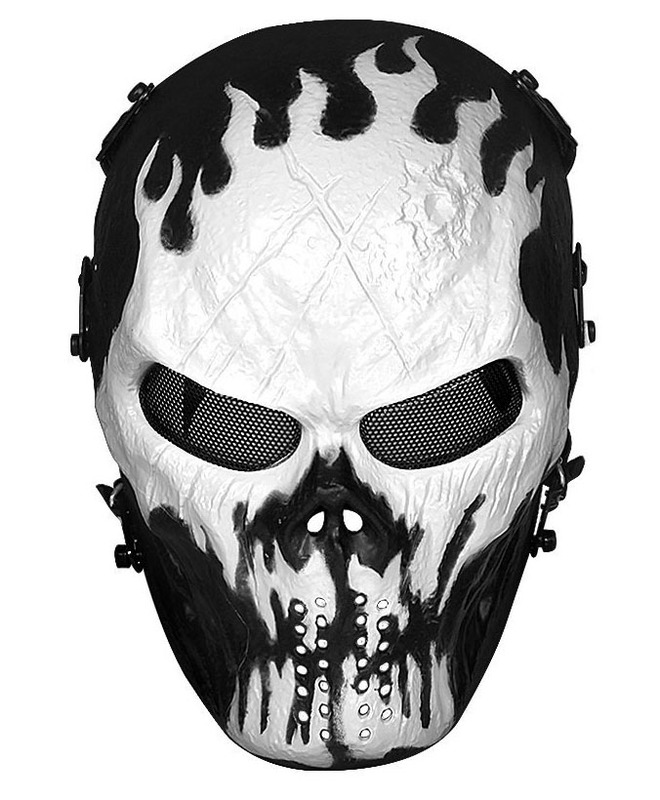 Although this mask was originally meant for paintball, there’s no reason why you couldn’t use it for airsoft as well. In fact, many airsoft players swear by the GxG Skull Mask. This one-piece mask provides perfect eye and face protection. It covers the forehead and your face, it also covers your ears really well (perhaps too well, having a negative impact on your hearing), but it doesn’t cover the top nor the back of your head. As far as safety is concerned, as long as somebody isn’t shooting at you from a tree – you’ll be just fine. If you wear glasses, good news for you; you’ll find it a perfect fit! The mask is super comfortable in general. With all plastic masks, this is not always the case. Big point scored here! The masl is quite durable, both the plastic that makes up the mask and the goggles. And if you’re worried about goggles getting fogged up; there have been very few complaints about that. The mask hardly ever fogs up, no matter how active you are! Small holes are drilled just above the visor, to establish some air circulation, a very much appreciated detail. A possible disadvantages for some may be that it doesn’t really protect your entire head. Looks can be deceiving, while it may look like a full heavy helmet, it’s actually quite light. Some may prefer this – just don’t expect a fully fledged helmet for such a price. This comes down to personal preferences. By and large, both types of airsoft masks fulfill the job of keeping your mouth and eyes protected, just fine. Half face masks are more adjustable, usually cheaper and can be used for a number of things outside of airsoft. Half face masks are also much more customizable and lightweight. The biggest drawback of half-face masks is that some areas may be exposed, such as parts of the cheeks, your forehead and the back of your head. Full Face masks are, on the other hand, more robust, don’t fog as easily and often look better. They are more popular in the fields of airsoft and readily available everywhere. There’s nothing worse than running around with a hot, sweaty had, gasping for fresh air. Luckily, this can be prevented just by making sure there are enough holes on the mask itself. Poor air circulation can seriously ruin the fun. Make sure the mask you purchase doesn’t sit too tight on your face and has plenty of holes/mesh for to supply fresh air. With half face masks, fogging goggles are a big big issue. Today, most goggles are sold as anti-fog; unfortunately that is often just a buzzword that manufacturers use. There are some methods to avoid fogging your glasses. Sprays, anti-fog pastes, anti-fog lenses or even oldschool tricks such as a bit of spit are all effective at different degrees. Your best bet, however, would be to invest in a nice pair of REAL anti-fog glasses, with little fans that make sure a steady air supply is established, virtually killing any and all chances of fogged up lenses. There nothing more discouraging then falling in love with a particular awesome looking airsoft mask, only to find out its completely the wrong size for your measurements. Some manufacturers will indicate the maximum head size. Others will claim that their mask is “one size fits all”. Always make sure you read a bit of the reviews other users have submitted regarding sizing and look up the measurements that the manufacturer has provided.